We had a relative lay in until 7am, departing Sheridan for the one hour journey to the Little Big Horn in time for the gates to open at 8am. 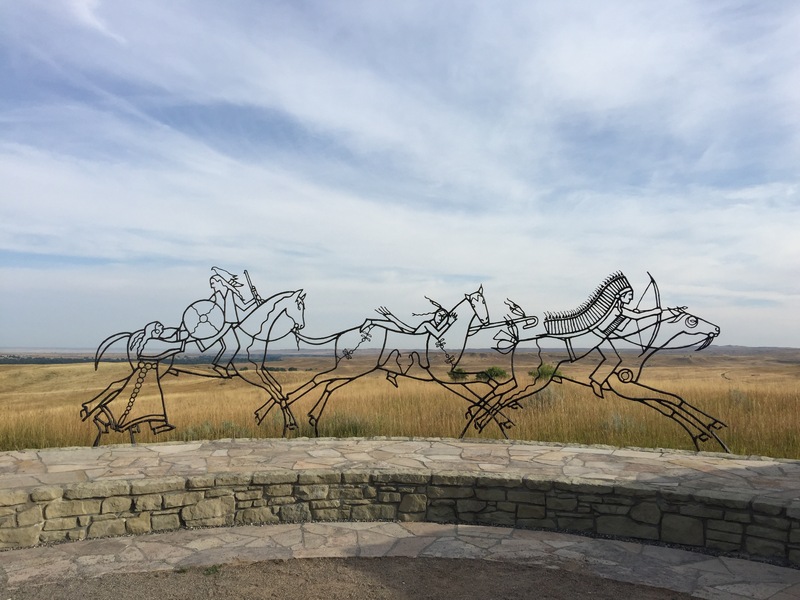 We passed over the Little Big Horn river and up to the visitor centre at the Little Big Horn Battlefield Memorial which commemorates the 1876 battle between Col. George Armstrong Custer’s US 7th Cavalry and the Lakota-Cheyenne Northern Plains Indians under Sitting Bull and Crazy Horse. The battle, on the 25th and 26th June 1876 has a unique place in US history – the final major clash of cultures that led to the beginning of the end for the traditional way of life for the native Indians. Our first stop was a short walk up to Last Stand Hill, where a simple monument commemorates the 220 or so US Cavalry men who died in the battle. Littered across the valley below and behind the monument are the white headstones marking were soldiers fell. Amongst the ones on Last Stand Hill is that of Custer, who with 40 men in a desperate final fight, shot their horses to form a barricade which was eventually overrun by Indian warriors. A short walk below the the Cavalry Monument are the head stones for fallen braves and a newer monument to the Lakota-Cheyenne warriors who fought at the Little Big Horn to preserve their way of life. At the visitor centre we watched a short 20min documentary on the battle which provide a solid foundation to the political events that led to Custers march into the Black Hills and the fateful events of June 1876. After watching the film, we downloaded the app which includes narration of a 5 mile drive from the visitor centre to the Reno-Benteen battlefield were half of Custers regiment fought a rear guard defender before finally being reinforced. Having spent nearly two hours at the site, we got back on the road. The drive down from Little Big Horn to the Devils Tower had been expected to take us around three hours, but we soon discovered that we’d driven into major road works. Not just lane closure roadworks but rather the entire road being dug up at once, but traffic still being allowed to drive slowly along the muddy gravel base. The result was a snails paced crawl and one very dirty rental car. Once back on the Interstate we were once again surrounded by dozens and dozens of bikers on Harley Davidson’s. As we neared South Dakota the numbers increased more and more, at one point driving passed a roadside bar in the middle of nowhere with as many as a thousand motorbikes parked outside. As we approached the entrance to Devils Tower the numbers swelled even further, the roar of engines at times deafening. As we pulled into the park, we noticed that the bikers had their own marshalls directing parking and traffic. We asked one of them why they were all here. The jovial bearded gentlemen informed us that we’d arrived right in the middle of the Sturgis Rally and that the next day, was the famed Wyoming Wednesday when the rally moves from South Dakota to Wyoming. The Sturgis Rally is the biggest biker rally in the world with 500,000 riders taking part in the ten day ride across South Dakota, Wyoming and Montana during early August each year and we’d arrived just in time for it. 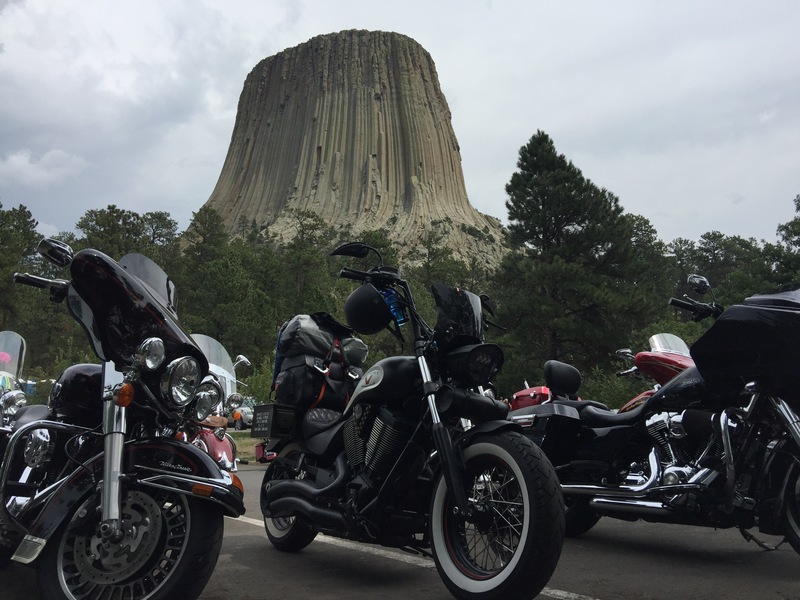 After bumping in to some bikers we’d met at Old Faithful we took the short walk beneath the boulder field and enjoyed the fantastic view of the Devils Tower butte and out across the prairie lands below. At 867 feet tall from base to top, and 1,267 feet above the river it’s an impressive natural phenomenon, casting an imposing figure over the surrounding lowlands. The butte was formed by molten magma being forced into sedimentary rocks forming a butte with a tear drop shaped top is 1.5 acres in size. After enjoying a relaxing walk we could feel raindrops falling and headed for the car where we sat out a flash rain shower. Our hope of it cleaning the car were foiled however – it simply made the dirt and sand muddier. 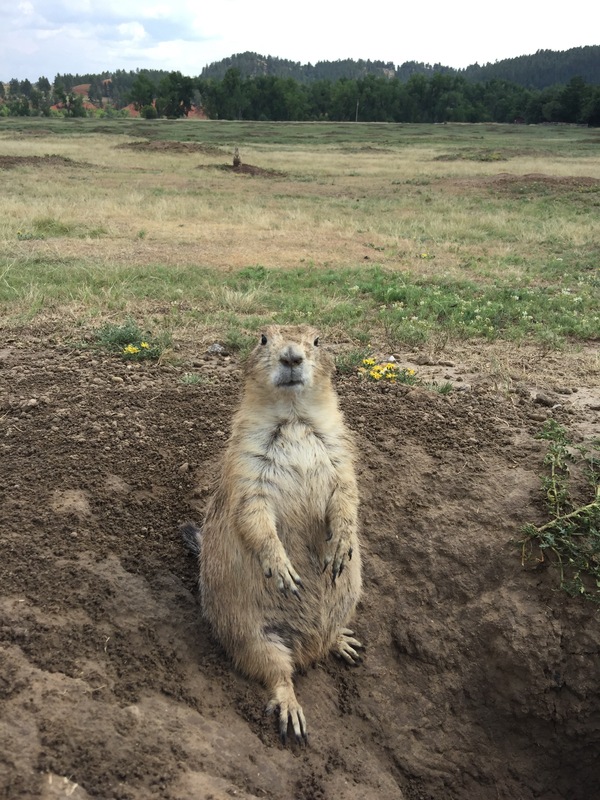 On the drive out of the park we stopped at Prairie Dog Town, a field we dozens of what look like fat gophers all stood curiously on their hind legs looking for food. We tried to get close for a photo but not too close as we watched a large bearded biker yelp when he got bitten on the finger by one. From the Devils Tower we head south east towards Rapid City, one of the largest towns in South Dakota with a population of 60,000. Apart from being a tourist Mecca and gateway to Mt Rushmore, Rapid City is famed for its bronze statues on street corners of every US President. 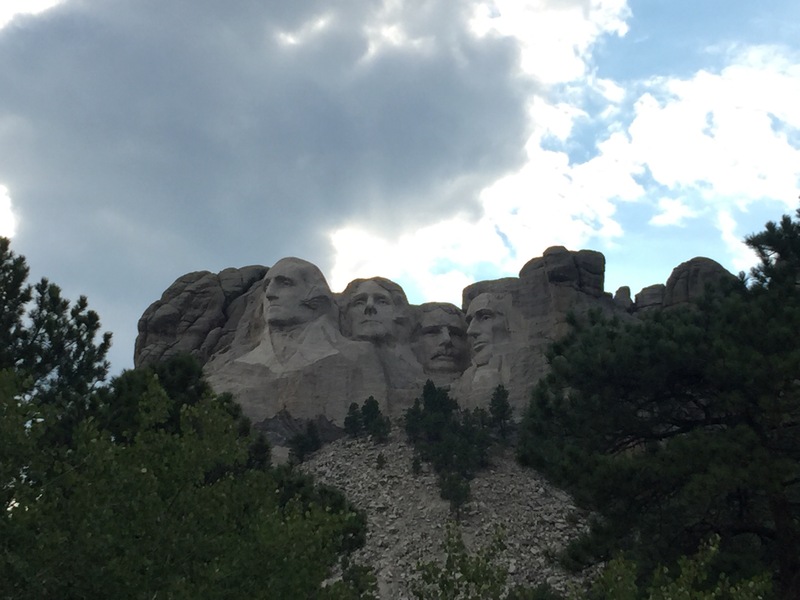 After a quick drive through the city we headed straight out, south the thirty or so miles to Mount Rushmore. Despite some questionable signage we arrived and paid our $10 parking fee and walked up to the impressive entrance and visitor centre. You can see the famed presidential heads as soon as you climb the stairs from the car park, but as you approach the main entrance you’re greeted by an impressive walkway lined with the flags and inscriptions of every US state and the dates they entered the Union. The work to consecrate Mt Rushmore began in 193x when President Calvin Coolidge approved plan to immortalise his predecessors George Washington, Thomas Jefferson (1801-1809), Abraham Lincoln and Theodore Roosevelt (1901-1909) in stone. While most people simply gathered above the main amphitheatre to take photos we decided to take the roughly mile long Presidential Trail walk which takes you beneath the heads for an alternative view. At each turn you get a different angle, sometimes a profile views of the different heads, while sometimes only a single president is in sight. We caught a glimpse of Washington through a crevice in rock before continuing around to the sculptors studio which houses some of the original moulds that the sculptors worked from. The best viewpoint however was just on the clockwise exit, a small platform no one else seemed to have seen. From here we appreciate the scale a precision of the work – we’d read recently that Mt Rushmore was underwhelmingly small – we can put that myth to bed, it’s exactly what we expected and well worth the visit. From Mt Rushmore we exited south towards the Crazy Horse Memorial, stopping briefly for a profile view of George Washington from the lay by. We continued the ten miles through winding mountain roads, through the town of Keystone until we arrived at the gates of the Memorial. Unfortunately for us, the monument is a private not for profit and so our National Parks pass which had served us so well wasn’t valid – instead we had to pay what felt like a rather extortionate $28 entrance fee for the car. After parking up the first things we noticed is that the rock carving is a long way from the visitor centre and the only way to get nearer was to pay an extra $4 per person to ride a rickety old yellow school bus to a viewing site. We had a quick browse of the visitor centre which houses a collection of India artefacts before buying our tickets and boarding the school bus. The driver gave us some interesting information about the Memorial which is the world’s largest active rock carving site, with the head 27ft taller than those at Mt Rushmore. 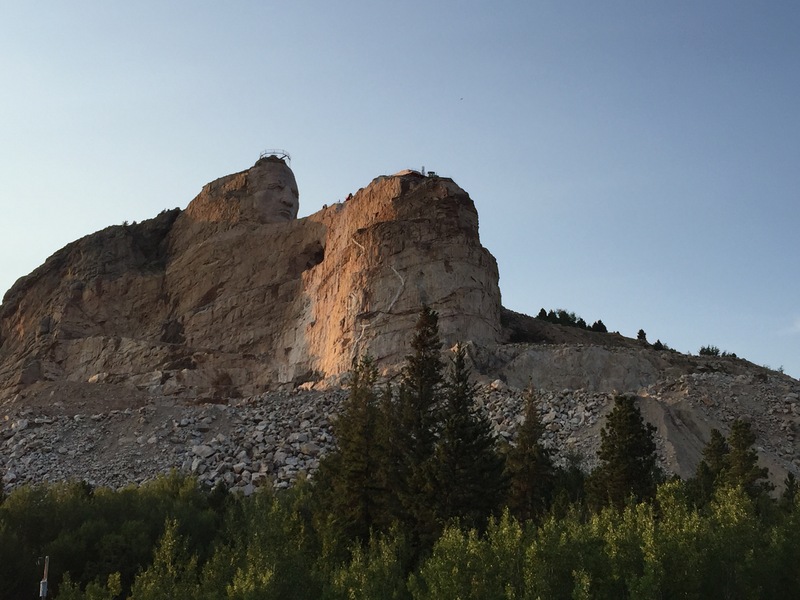 Work on the Memorial began in 1948, and despite 70 years of back breaking work it is only a fraction of the way to completion with the face of Crazy Horse now largely complete and work going currently focussed on his arm holding the mane of his horse. It’s estimated that with advance in modern technology it will take the team of fifteen full time sculptors another 40 years before it is completed. For anyone planning to visit, the bus ride is essential, you can’t get anywhere up the monument due to the work going on, but you do at least get a good view from the base. Despite the temptation of staying for the 9pm light show, we decided to head to our hotel in Rapid City. After a long days driving and the sun setting, we arrived in darkness – the upside of our long day driving meant we’d have a lay in the next day.